1.Boil 2 cups water in a pan and add the soya granules to this boiling water, allow them to cook for 5 mins, and then drain out all the water by squeezing the granules. 2.Boil the potato, French beans and peas and smash them properly once they are cooled. 3.Finely grate the carrot and beetroot. 4.Now mix the soya granules, grated carrot and beetroot with the smashed potato mixture. 5.Add turmeric, red chilli powder, ginger chilli paste, dhania jeera powder, amchur powder, lime juice and salt and mix well. 7.Dip the cutlets in semolina so that they are covered with it from both the sides. 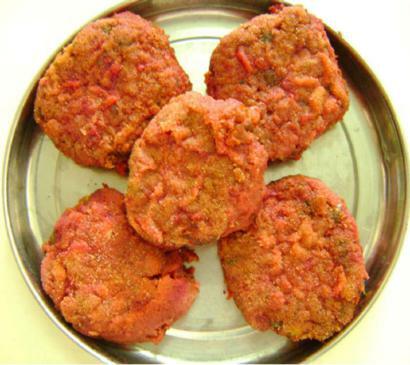 8.Heat oil in a frying pan and shallow fry the cutlets till golden brown from both the sides.